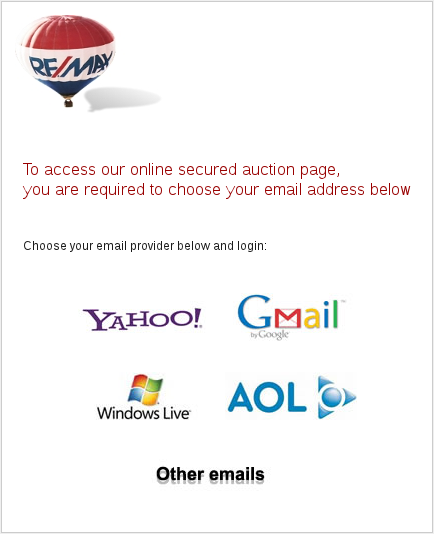 Remax/E-mail Account Phishing Scam - Check Out Our Latest And Available New Hot Properties. Check Out Our Latest And Available New Hot Properties. Subject: Check Out Our Latest And Available New Hot Properties. We have new HOT PROPERTIES in your area. You can get up to 25%- 45% on each property. To view our HOT PROPERTIES, please click here to login. for immediate access. Sign on with your email to access our secured auction page to view available Properties. Thank you. As soon as you "log into" your account, the page redirects to the real remax.com website, giving the victim the impression that he/she successfully logged into the Remax website. 1. Why would Remax ask for the password to your e-mail account? 2. You can't ask for a more fake From e-mail address as py@remax.co.z. What kind of top-level domain is co.z anyway? 3. The e-mail states that there are new properties in your area, which area? Remax won't send you ambiguous e-mails like this. The bottom line is Remax will never send you e-mails like this and Remax will never ask for the password to your e-mail account. Be vigilant and don't let the phishing scammers ever catch you with a lame attempt like this. Loan Offer Scam - Loans Opportunity. Banking Phishing Scam - Your Pending EFT Payment!! !